There is only one reason why I wanted to treat myself to writing a guide on the best bicycle kickstands today. And this is it…. Can I kick it… Yes you stand. Right now I’ve nicely set the tone, let's do this. Wait, wait. If you're busy and don't have time to read the guide just pick the Pletscher ESGE. It's straight and durable. The perfect kickstand combination. 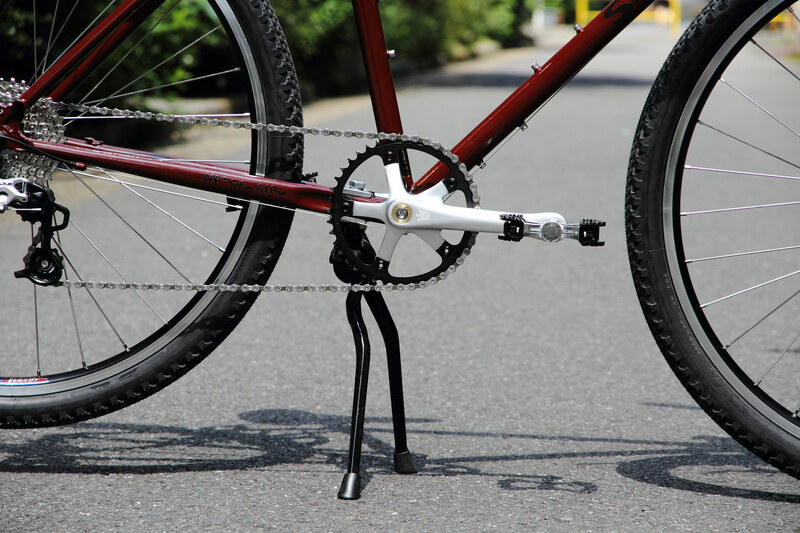 Very simply a kickstand is a piece of metal rod that attaches to the frame of the bike to enable it to stand up unsupported. 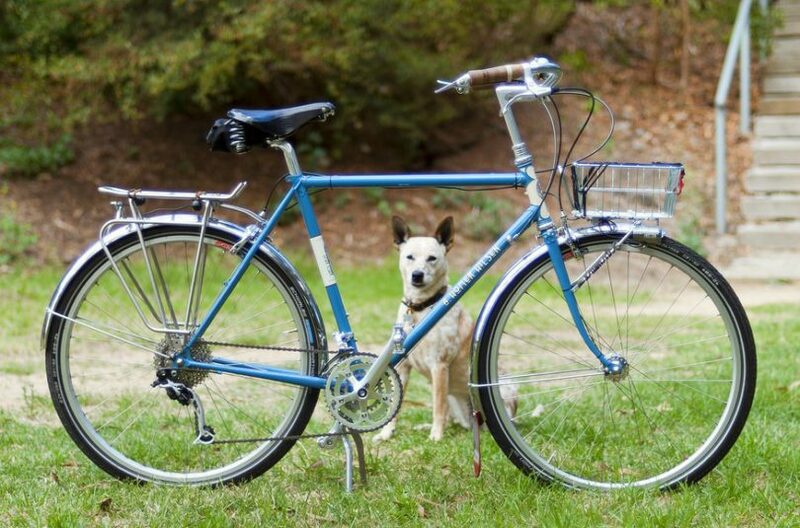 People buying a new bike for the first time are often surprised to learn that most bikes come without stands nowadays. That mean's if you want one you'll have to purchase it separately. Now, they're NOT for everyone, but for a select few they're incredibly useful. Below I've included my top picks. BV is a Dutch bicycle company founded in 1917. As well as bicycles they also produce mopeds, and they're the largest E-bike manufacturers in Europe. It comes with a spring-loaded latch that enables you to adjust its length easily. The latch is great if you're on uneven ground and need your stand in an unusual position. What also makes this latch unique is that you can adjust it without tools. Making changing it on the go easy. Unlike more expensive options on the list, this stand comes with non-slip soles and reinforced plastic feet. This stops it from slipping on wet surfaces or sinking into the mud. The BV side kickstand is a nice all rounder if you're looking for something that's simple and lightweight. However, if you're looking for something a little more robust I would start considering some of the other options available here. Chain stay fixing may not be suitable for some bikes. What are customers saying about the BV Side Kickstand? Customers speak highly of this stand. Many of them praise its adjustability as other stands in this price range come in a "one size fit's all" style. However, nothing's perfect. There are bound to be flaws with a product that's this cheap. One reviewer noted that his stand extends too far past the chain stay. His foot hit it on a few occasions causing it to extend while he was moving. If he'd extended it while cornering, he could have had a serious accident. If this is something you're concerned about, I would consider looking at stands that fix to the ﻿﻿rear axle instead. They're not as stable, but you won't kick them. If you're after something more stable than a single leg, here's the double legged version of the stand above. It comes with rubber f​eet to grip in wet conditions and can be adjusted easily to fit your needs. The loaded latch springs the legs out the way when you kick them so you can't catch them like you would a side stand. This stand is for a rider that's carrying some heavy weights. If you're just popping to the shops, then this will likely be a little overkill for you. Related Post Zipp 303 Vs 404: They’re Both Excellent But Which Is Best? But if you have a heavy mountain bike or are carrying around some touring gear then this would be a good choice. Can only be fixed onto a kickstand plate so may not fit on some bikes. 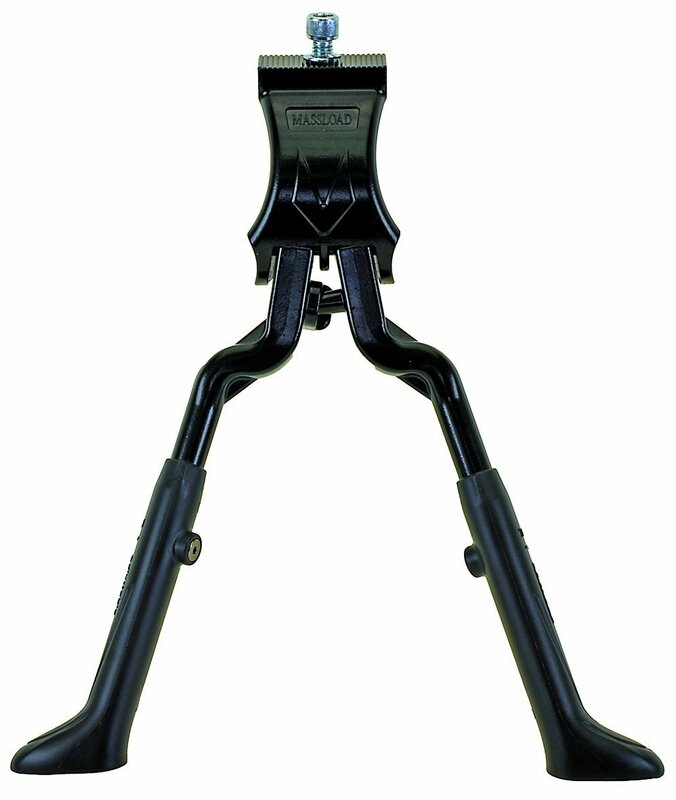 What are customers saying about the BV Double Leg Kickstand? Buyers are often torn between the BV double leg and the Pletscher (reviewed later). The BV takes the win because it's half the price and you have the option to adjust the leg without cutting it. One rider mentions that he tows a child's trailer. He says that he's able to load his son into his seat and fix his seat belt without any trouble. Even when the ground is soft and uneven. On the flip side, a few riders mentioned that their stand snapped a few months into using it. Of course, it depends on the types of loads you're carrying and how much you're abusing it. Reviewers have mentioned that it tops out around 150lbs over the bikes weight. So that's worth considering. The M-Wave brand is part of a larger company named Messingschlager. The German company was founded in 1924 and has gone from humble beginnings to a 14,000 m² warehouse. An example of their quality is how their stands feet fold together upon retraction. Meaning the legs are tucked completely out the way. Similarly to the BV Double leg. This stand mounts to your frames kickstand plate. 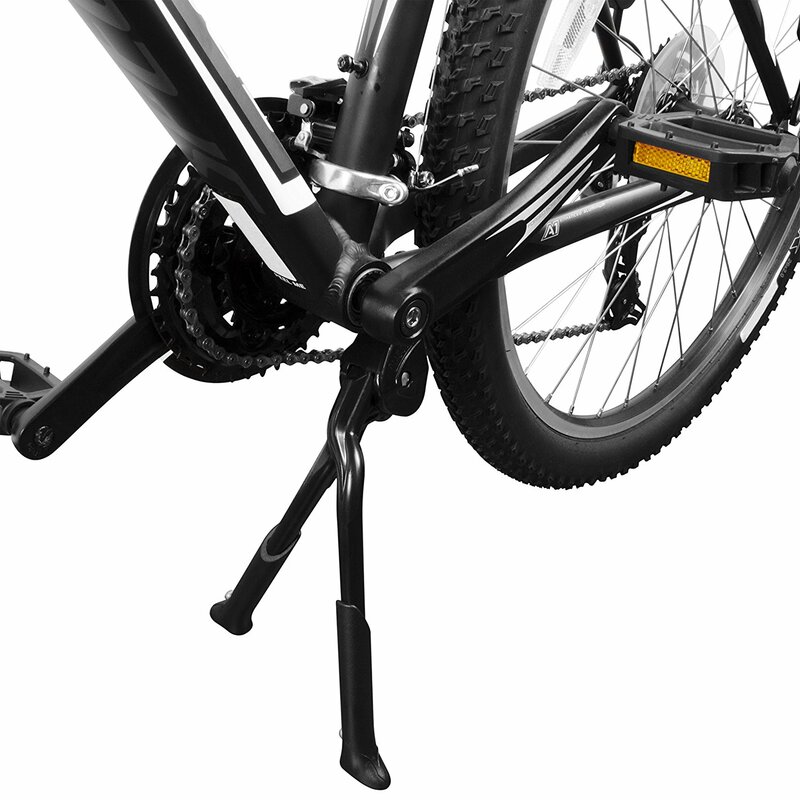 If your bike hasn't got a kickstand plate, you should get a stand that attaches to the chain stay or axle bolt. One reviewer found a workaround using this bolt. But it sounds like a bit too much effort for me. It's got large rubber feet for extra grip, and as with the other stands in this list, it's easy to adjust. Similarly to the BV range, it's adjustable without tools. Perfect for alterations on the go. The general opinion of the stand is that it's a brute. If you need stability above all else, then M-Wave is worth considering. Of course with the extra stability you're adding weight. So this is most likely overkill for someone who's riding around town on their cruiser. A few reviewers put the stand to the test by rocking it. They were impressed by how far they could push their bike and have it still return to the centre. One thing to take into consideration with this stand is that it's more expensive than the both the BV models here. But to summerise what another customer said. "I had other cheaper stands before this one, but I'd always come back to find my bike laying on its side. A few $10 mirrors later could have already paid for this. So save yourself some money and get this stand first time round". It's highly praised, but there are two disappointing aspects of this design. Some reviewers have had trouble with their stands adjustable latch slipping​. If this happens with the bike fully loaded, you could be in just as much trouble if you didn't have a stand at all. Secondly, many reviewers have stated that the bolt that comes with the stand is too short for them to use. If you find that this happens to you, you'll have to purchase a longer bolt separately so that it fixes on to your bike. It's a shame, but it's not the end of the world. The Pletscher is the kickstand poster boy. (If there ever was a thing). In photoshoots you'll see many Surly bikes proudly held up by the Pletscher. And for good reason. However, this stand is the most expensive and there's no way to adjust it. But this is actually a good thing. Because there is no adjustability on it, it means that there's less to go wrong once you've cut it to the size that you want. There will be no slipping like there is with other stands. However, the downside to this lack of adjustability is that you have to actually cut the metal and once it's cut you can't go back. The stand comes without rubber feet to stop it from slipping in the wet or sinking in mud. (You can still get them but need to buy them separately). This is fine, but when you're already paying a premium price, you expect them to be included. These are compromises you make to have one of the sturdiest stands going. But this may be too much for you. In that case, I would stick with either the BV Double or the M-Wave​. No adjustability means that there's less to go wrong once you've cut it. The only stand in this review that comes without rubber feet. What are customers saying about the Pletscher? But reviewers have advised others against getting them as they "wear out quickly, and the stand works fine without them". Other than that the stand could not really be faulted. I guess at the end of the day it's simplicity that takes the win​ here. Who should NOT invest in a kickstand? Kickstands are great and serve a purpose. However, to be honest, some cyclists just shouldn't get one. If you’ve got any desire to be taking seriously as a road or mountain bike cyclist, then you should consider if a kickstand is something you want. I've laid out my thoughts below. You’ve most likely paid a premium price for a lightweight bike so it would be silly to bolt an extra weight onto the frame. With road bikes, the lightweight tubing wasn’t designed to handle the additional stresses that are created by the kickstand clamping. It's unlikely that you'll be spending much time stopping off​. When I'm on my road bike I usually do the route and finish off back where I started. If I had a kickstand attached to my bike I would have carried it around with me for no reason. *If you’re adamant you should get one then the BV side stand is the best kickstand for a road bike as it’s the lightest. If you’re a serious mountain biker, then it’s likely that the extra metal clamped on to the frame will get caught on the uneven surface as you fly down the mountain side. If you're riding bumpy, uneven terrain it's likely that your kickstand will rattle enough to make you not want to ride at all! Although, again, if you're a mountain bike rider and adamant that a kickstand is for you then I'd give the Pletscher a go. It's the most durable and sturdy of the stands here so will fair the best against the odd knock. Who SHOULD invest in a kickstand? If you're not a mountain biker or a roadie, you'll likely ride either a hybrid, cruiser or a tourer. In which case you could give a kickstand some consideration. If you're touring around and have all your gear loaded on your bike, it's incredibly useful to have a sturdy kickstand. With the bike being so much heavier it can become difficult to balance it against walls without it slipping. You can do quite a bit of damage to your bike and gear when it topples over fully loaded. I went on a long trip around Europe without a kickstand. I didn't have many valuable things on me, but I did have brunch bars stored in the panniers. Related Post Best Torque Wrench For Bicycle Maintenance: Which One Is It? I'd constantly forget about them and rest my bike on it's side. When I came to eat them, I'd have a packet of crumbly mess! Having a kickstand would have made things far easier. Hybrids and cruisers fall into similar categories as you'll likely be rolling slowly and parking​ up. This is when a kickstand is brilliant. Slow cruiser riding is what 99% of my cycling is currently. At the moment I'm riding the most beat up, shocker of a bike around the beautiful town of Hoi An in Vietnam. For some reason, all the bikes in this area are like the one I have... I've no idea why as they're terrible. However, the bike has a kickstand, and I genuinely love it. (it's about the only thing on the bike I do like)! The reason I love it is because of the way I use the bike. I use it as my primary form of transport. So I'm always parking up outside coffee shops and restaurants. Many people cycle here, so there's not always a wall to rest against. If you've found yourself in a similar situation, then a kickstand may also be for you. Adjustable - When a kickstand says that it's adjustable it's talking about adjusting the length to fit bike of different sizes. 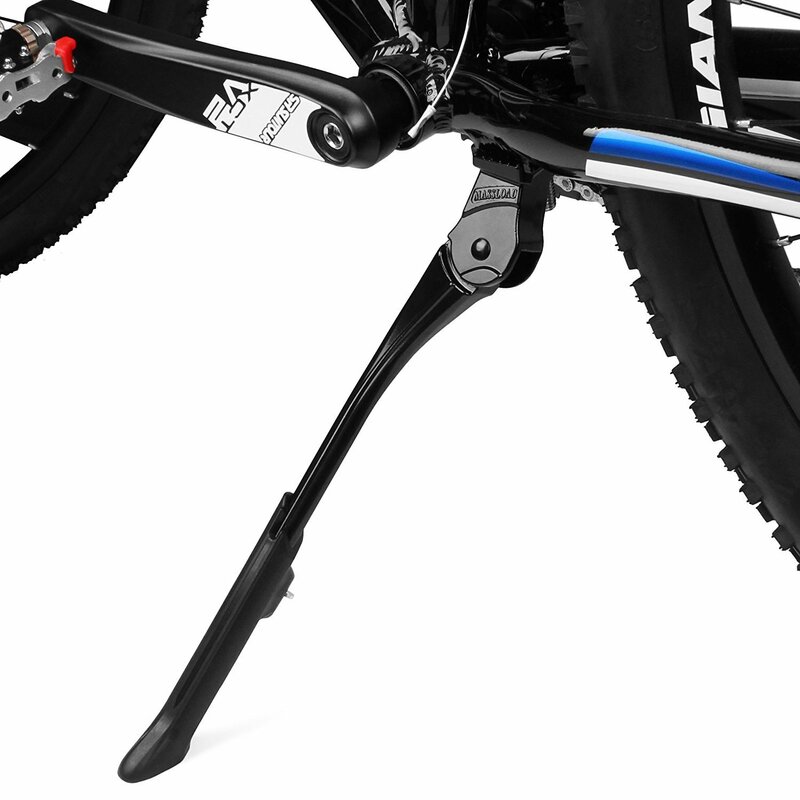 Most kickstands will come with their own patented adjustable height designs. 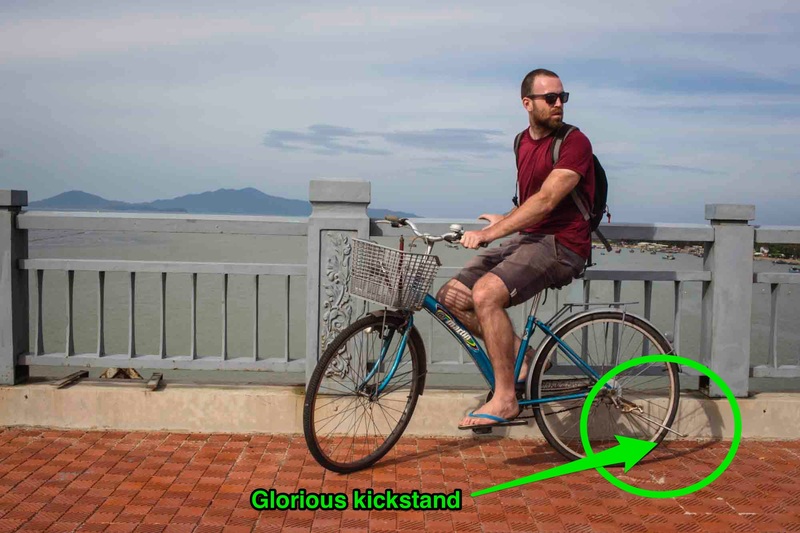 There are three main types of bicycle kickstand, and I've gone through them below. 1) Rear axle - These stands are the lightest available and fitting on the rear axle means that they're completely out the riders way. (It's what I currently have on my bike) However, they're the least stable kickstands so they'd only be suitable for light bikes and casual rides around town. 2) Chain stay single leg - More stable than a rear axle stand. But they have been known to get in the way of riders pedal stroke. 3) Double legged - these are your bad boy heavy duty stands, designed to withstand some serious weight leaned upon them. These stands are most suitable for touring style loads, as they may be a little overkill for anything else. There aren’t many alternatives to a kickstand. A metal rod attached to the frame is pretty much as simple as it gets. The Upstand is popular. Instead of attaching the stand to the bike with a bolt it fixes to the bike via a strong magnet. Once you're ready to ride you simply pluck it off and stow it away. Of course the downside to this is that you'd need to carry the rod around with you some how. ​Although it folds up nicely so it shouldn't be too bulky to carry. Or another viable option is the Click-Stand. This one works by resting on the top tube, and I could see it working quite well. I would be wary of putting too much weight on it but it's recommended by Crazyguyonabike.com, and that guy knows his stuff. If you fit into one of the categories we've spoken about above then, you should get one. I'd go for the BV single if you're looking for a lightweight version. And I'd go for the Pletscher if I wanted a sturdy version. It's a ballache having to cut the Pletscher but it's one of the best bicycle kickstands around once everything is set up how you need.